“Since I have to water the fertilizer in anyway, may as well wait for a rainstorm!” That’s a good idea, if you’re planning on fertilizing before the storm. But once it’s passed, you have to wait until the blades of the grass are dry again before fertilizing the lawn with anything but liquid fertilizer. Granular fertilizer—especially quick-release formulas—can start to burn grass blades immediately if applied while still wet. The blades will take on a mottled, yellow-and-brown-spotted appearance when left there for just an hour. 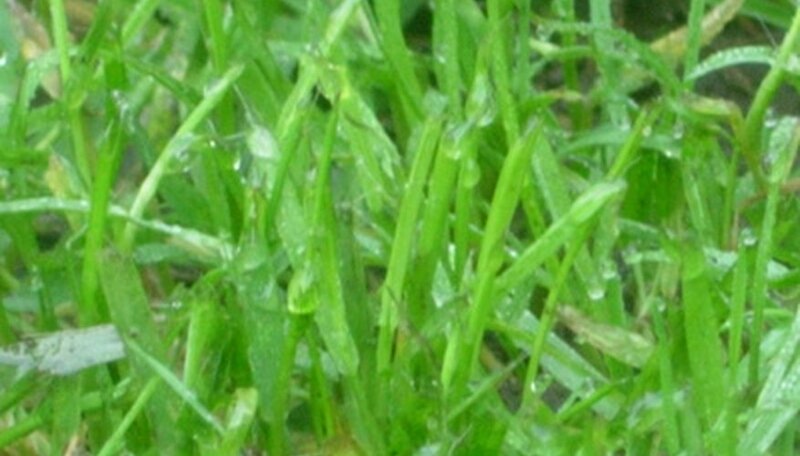 The lawn may even start to yellow and die with prolonged leaf-blade contact, even if the fertilizer was later watered into the ground. The leaf blades need to be dry before applying granular fertilizer. No rainwater, dew or irrigation should be clinging to the leaves. Even heavy fogs and mists can start to activate the granules. You may have to wait a day or so after a heavy rain, but it’s worth the wait to avoid burning your lawn. Liquid fertilizer is another story. You can apply it after a light rain, and the added dampness will even help disperse the fertilizer. But avoid applying right after a heavy rain, especially in soils that are slow to drain, such as clay. The fertilizer will either sit on the surface too long, causing damage or volatizing, or it may just run off the surface. Don’t apply any kind of fertilizer—organic or otherwise—to saturated ground. If it’s so wet it’s squishy, the fertilizer will just run off or leech too deep for the roots to benefit. This wastes money for you and contaminates storm water drainage systems, which eventually end up in lakes, streams, oceans and drinking water. Damp soil is fine, and you should always water in fertilizer, but don’t overdo it. Far more forgiving and beneficial to the overall health of your lawn are organic fertilizers. These can be anything from compost and manures to fish emulsions and kelp or even the clippings from mowing the lawn. Applied sparingly (the recommended application), these fertilizers last a long time, build up soil structure and quality, and aren’t as likely to burn your grass if you accidentally apply them while the turf is damp. Can You Use Old Motor Oil As Fertilizer?